Perfect love and perfect trust, is all that we should know, to rise above life’s cut and thrust, we have a way to go. The darkness birthed within each soul it’s offspring, known as fear and in our fearing we forgot the love that brought us here. A greening globe, a shining sphere that once knew only light, was spun from orbit, falling, deep into the veils of night. were not to bind us but to stretch, to help our soul’s winged flight. That guiding reign of pure intent forgotten in the deep is now ascending, pulling, to awaken us from sleep. The web of light around this orb, our home away from home, birthed simply for Her Light to feel, the darkness of alone. So now we feel the tugging pull, as She reels us in and one by one we must ascend, rejoining with our kin. It’s not that we must leave this realm, the reverse in fact is true for there are also other kin within this Planet blue. They were the Fae, the conquered race, who could not stand the dark, who then withdrew and human kind were left to make their mark. No guilt, no fears, no human tears can heal the rift we wrought but if that’s so has our descent been truly, all for nought? The Lady knows, She holds the threads, She guides us even here, the depths of life’s illusive paths, each step a mortal year. Each birth anew upon the Wheel, together yet apart, we now as one, ascend to heal Earth’s frail and failing heart. We feel the pull, as veils thin, to let us see beyond, the Fae returning bring the light, once hidden…almost gone. 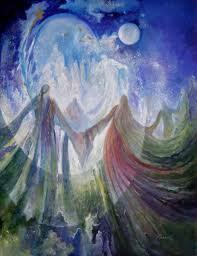 The realms of beauty and of love can not be as before, this tapestry of spinning threads must change to be restored. So once again life must ascend, as dark is filled with light, we see all that is mirrored, as once day gave way to night. No separation truly is, between each soul, each spark, for She has never let us fall completely, to the dark. For half of Her is light indeed, as the other half is night and our descent was that we learn, we’re always in Her sight. She shone within us all along, She taught us how to fly. In freedom, joy and clear intent, we flew the well of fears, and now renewed, reclaimed, rebirthed….cleansed by mortal tears.